Follow the scrapbooking tips techniques and ideas below to make a stunning page with an expensive look! Don't waste your money on double sided paper when you can make the same effect with single-sided paper. This page will walk you through steps on how to make a page with a corner fold. The fold will be a different color/design than the main page. First, decide which corner you would like to have the corner fold. I have chosen the upper right-hand corner. Next, take your full page scrapbook paper and turn it over so that the good side is down. 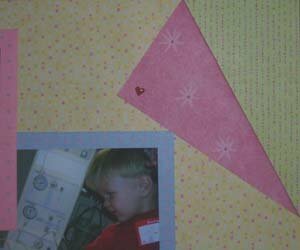 Take the scrap that you would like to make as your "double-side" and paste/tape it onto the upper left-hand corner of the full size page you have in front of you. Next, flip your page over and fold the upper right-hand corner down to make the desired look. Be sure you do not fold it farther than the size of your scrap. Now that you have decided the size of your fold, unfold the corner and flip the paper back over, again. Line up the corers and using the crease as your guide, paste or tape the scrap to the back of the page, good side down. The pasting/taping should be just below the crease line. If you would like to embellish your corner, now is the time to do it. Place an eyelet or brad on the corner fold to make a purposeful look. The brad really only needs to go through the top fold. You then can paste/tape the fold to the paper. This will still give it the look as if the brad was holding the fold down, without having to punch a hole through all the layers. With an eyelet, you will probably want to go through all layers of the fold to get the right look. I hope you will be as pleased with your results as I was when following these scrapbooking tips techniques and ideas. You Tried It? Now Show It! Have you tried the "Double-Sided Paper Technique" described above? If so, share it with us! !